If you are up for some challenging approaches and tricky landings while you like to enjoy spectacular scenery, here is a good suggestion for a destination – try visiting the French altiports. 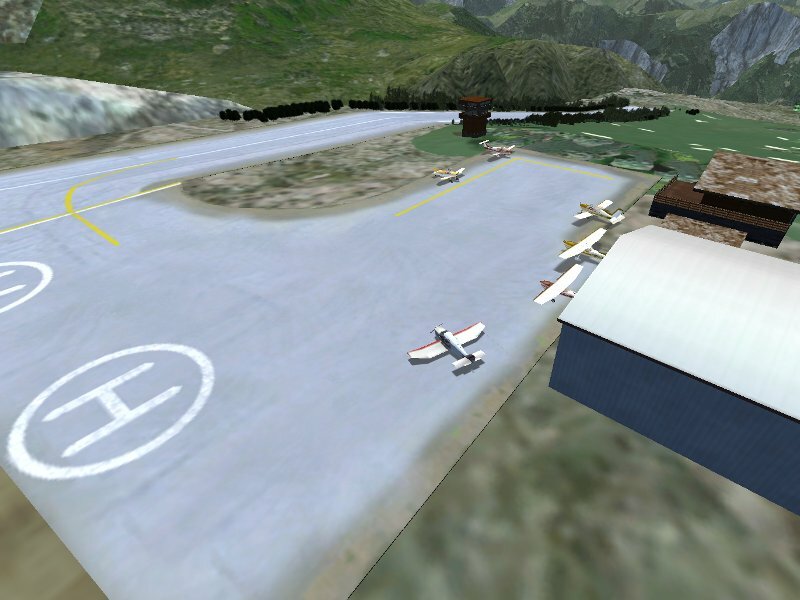 Altiports are small airfields for small aircraft and helicopters located high up in the mountains, often serving a ski resort. The runway is usually short and quite steeply sloped (in the case of Courchevel, the slope is a solid 18.5%), and all landings are done uphill with no go-around procedure. Since the alitports are by no means in the mountain summit region, the approaches must be done in the confined regions of a valley, which means they are usually curved and somewhat dangerous. As a rule, no navaids are available, thus altiports can only operate in good weather – all this adds up to a challenge. In fact, the History Channel program ‘Most Extreme Airports’ ranks Courchevel as the 7th most dangerous airport in the world, and once you do your first approach, you will quickly discover why. 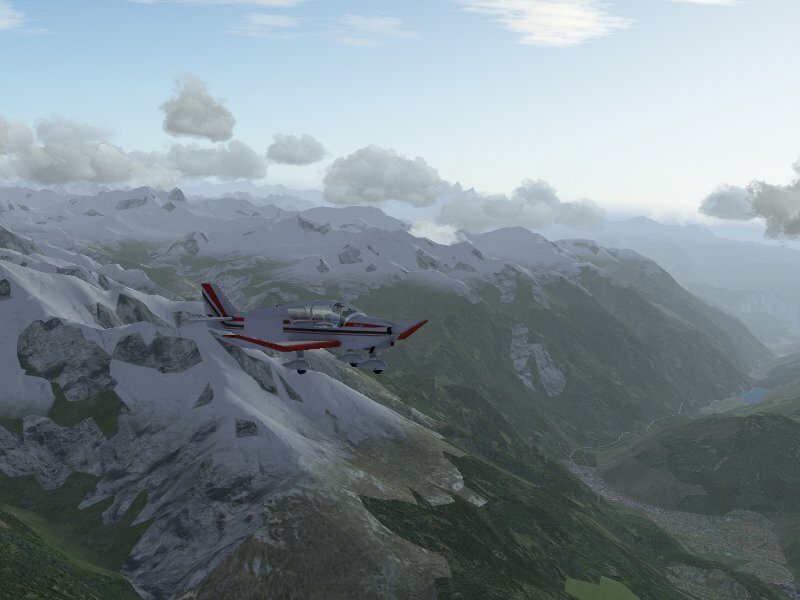 Flying the French Alps is significantly more interesting by using the highly detailed custom scenery which is available for free under a Creative Commons Attribution-ShareAlike 3.0 here. 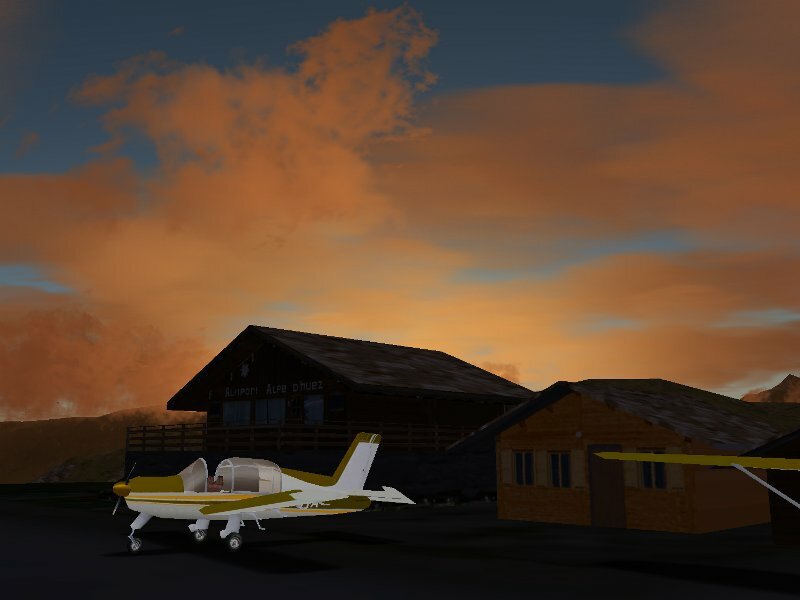 There are six altiports in the French Alps, L’Alpe d’Huez, Courchevel, La Rosiére, Mégève, Méribel and Valloire, along with a number of airfields in the valleys. 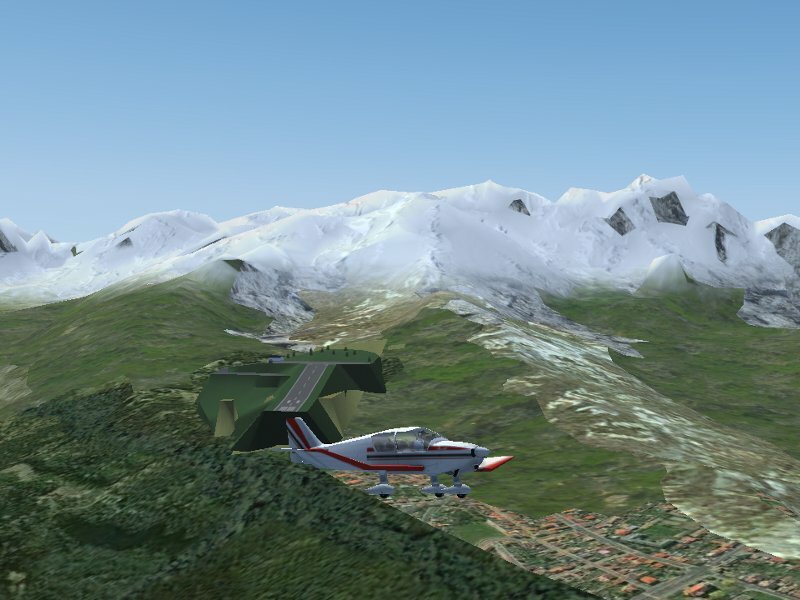 The first two of these, L’Alpe d’Huez (LFHU) and Courchevel (LFLJ), have been modelled in detail for the custom scenery and are available from the PAF team hangar here. 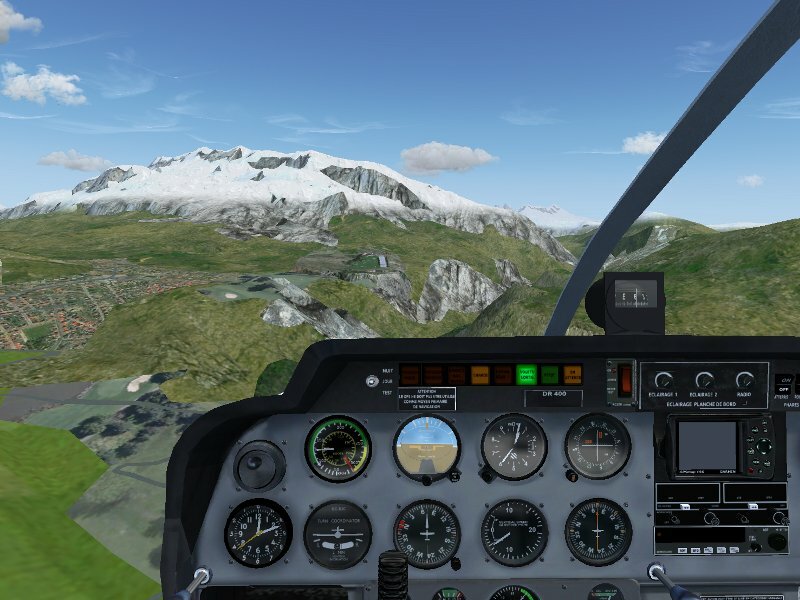 This package also contains a detailed model of Grenoble Le Versoud Aerodrome (LFLG) which is a good place to take off for a first look at Courchevel or L’Alpe d’Huez. Beginners are probably better off with a powerful turboprop STOL aircraft like the de Havilland DHC-6 ‘Twin Otter’ which has the climb rate to pull out of dangerous situations, but the real challenge is better experienced in a small aircraft like the Robin DR-400. With a constant pitch single propeller and no retractable gear, this plane is, especially when passengers and baggage are on board, seriously taxed to climb over the high mountain ridges which in many cases reach above 11.000 ft. The fuel and payload menu item allows to adjust both the fuel level in the tanks as well as any additional weight on board. 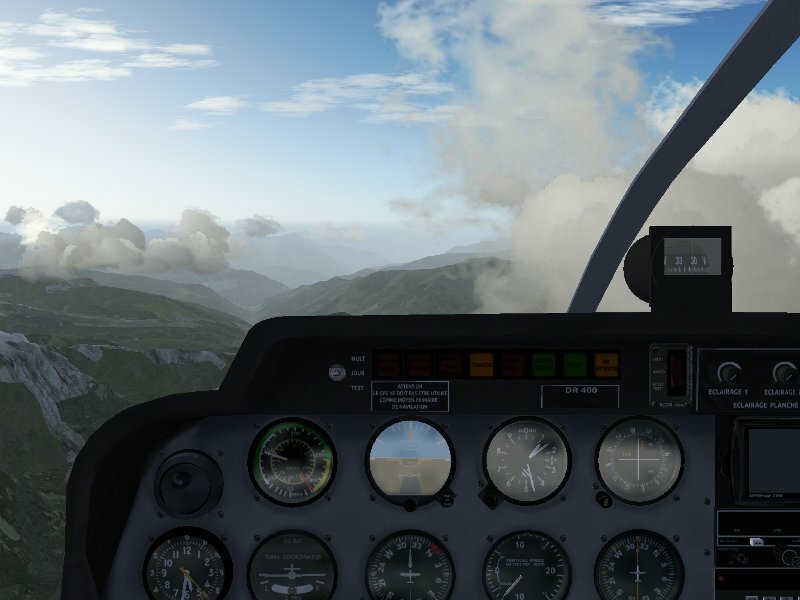 Asymmetric weight distribution in JSBSim is in fact taken into account properly, if for instance the copilot weight is reduced in flight, the plane starts to roll. 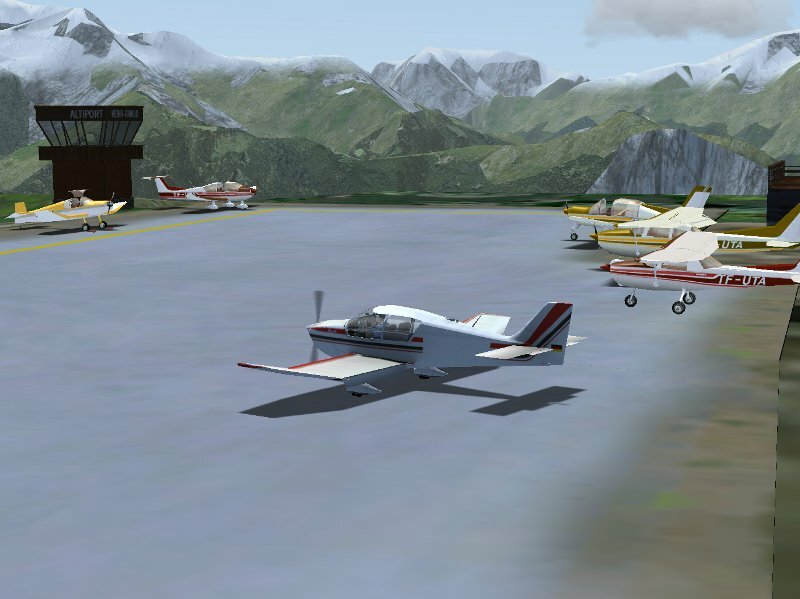 Here, a DR-400 is lined up for takeoff in Courchevel with L’Alpe d’Huez as destimation. 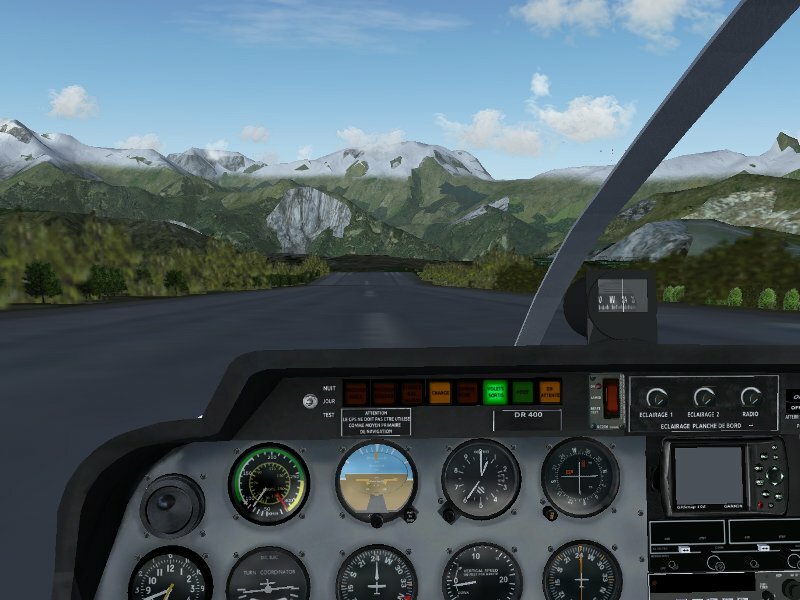 Since the airport is at an altitude of about 6500 ft, it is important to adjust the mixture properly to the altitude in order to get the full engine power for takeoff. 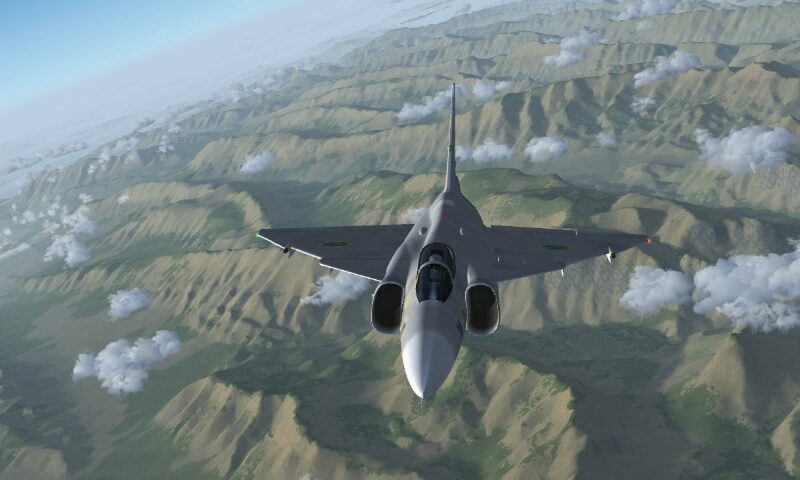 Once the engine is running at full power, the brakes are released and the plane accelerates quickly down the steeply sloped runway, becoming airborn halfway. Departing from Courchevel, it becomes readily apparent why the altiport is challenging and why there is no go-around procedure available. On the direct way, the high ridges of the Vanoise National Park with elevations well above 9000 ft have to be crossed – with the fully loaded DR-400, this is a slow climb over snow-covered mountains. 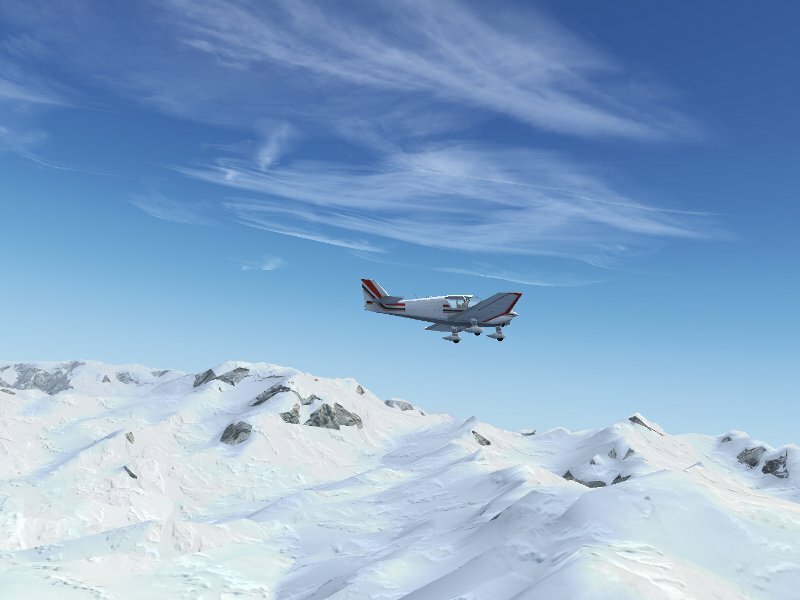 Snowcover in Flightgear can be generated by shader effects with a user-controlled snowline. Since the shader effect does not place snow on steep slopes, the outcome looks very compelling. However, also the lower valleys during the descent to L’Alpe d’Huez have a lot to offer. This is the final approach, aiming between rocky cliffs. At this point there is still a chance to break off. The final moments – we are committed to a landing now. The trick is to aim low and reach the threshold in level flight, then pull up to follow the slope of the runway, let gravity develerate the plane and let it touch down softly (if you try a normal approach on a runway with such a steep slope, you will break the gear) and not throttle back engine too fast, because the plane still needs to reach the top of the runway, and once the plane comes to a halt on the slope, the engine often is not powerful enough to get it moving again. All went well – time to enjoy the company of the other pilots and have a coffee before heading back to Courchevel. In bad weather, things can be much worse. If the valley is cloud-filled, there is no choice but to turn back if no good view of the airport is possible early on. And in gusty crosswinds, hitting the runway just right is a challenge on its own. 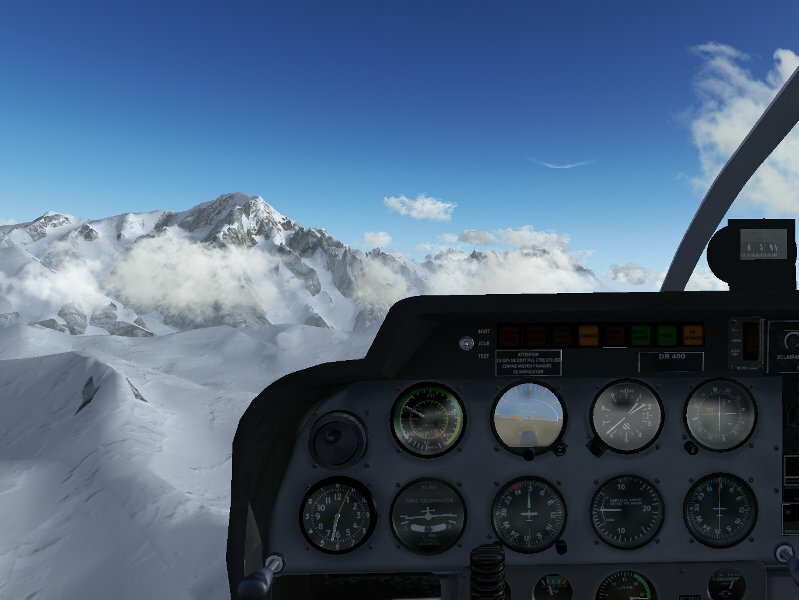 However, once one masters the challenges of high-altitude flight and navigating in the confines of valleys, flying the Franch Alps in nice weather is primarily a good way to see spectacular scenery. Let’s head back to Courchevel! 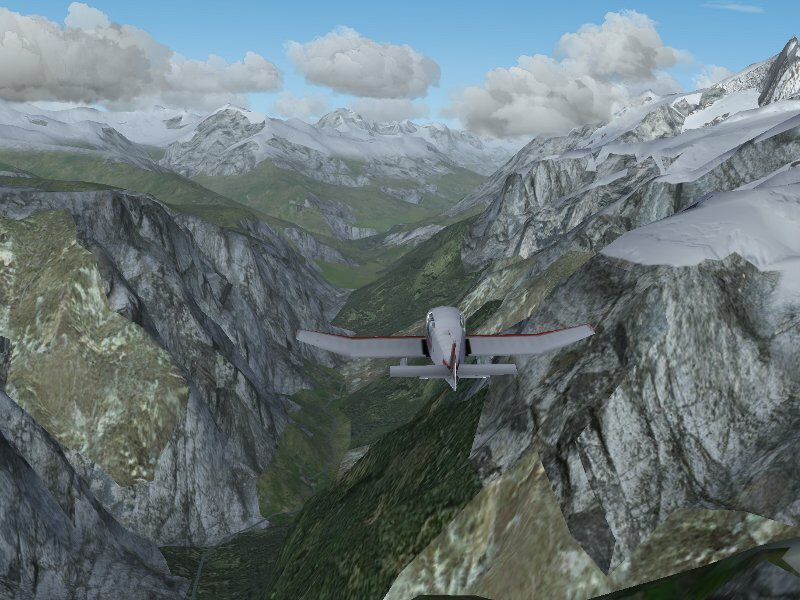 Here, the DR-400 accelerates down the sloped runway of L’Alpe d’Huez – going down, airplanes accelerate much faster than one is used to on level runways, so we can get airborn in just a few moments. Leaving L’Alpe d’Huez, the village and ski resort becomes visible. The winding road up from the valley is actually a popular mountain stage of the Tour de France. 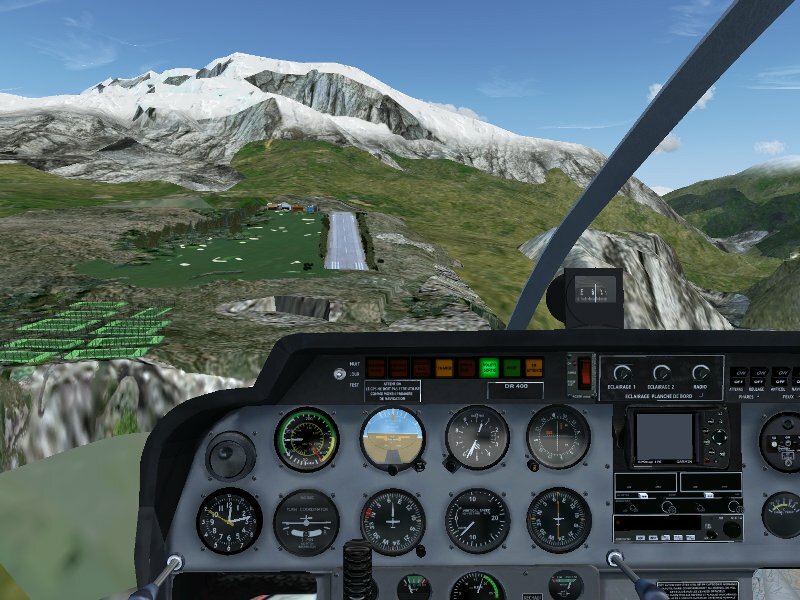 The vicinity of L’Alpe d’Huez has deep valleys, spectacular cliffs and Canyons and steep, rocky mountain faces – one can fly through the valleys or high above the mountain ridges. Enroute to Courchevel, we leave the high ridges behind and cross to the Vanoise Park in the vicinity of Modane. Descending again, Courchevel becomes visible (just to the left of the screenshot) while the lower valleys vanish in afternoon fog. Of course, one of the must-see destinations in the vicintiy is Mt. Blanc, towering at 15.781 ft above most cloud development. Its rocky lower slopes and steep cliffs make for some really spectacular scenery, and especially at sunrise or sunset, the view from the summit is spectacular. As the sun goes down, the last clouds light up over L’Alpe d’Huez which is to be closed over the night. High time to get back to Grenoble.